Paul Feinstein is one of our most knowledgeable sour and Belgian beer brewers in Sonoma County with decades of experience in the aging process. We have long enjoyed his presentations and his hosted tasting within the local Sonoma Beerocrats homebrew club---he has become a wonderful local guide and luminary for the beer community. With his background in medical engineering, he has neat toys around his house such as a dissolved oxygen meter. When it come to considering HDPE as an appropriate material for long term storage of beers, most of us are stand-off-ish. It is generally considered to be a porous or oxygen permeable material. This is also the case for oak barrels. Over the last year, Paul has been experimenting with sour aged beer in both wood and HDPE storage vessels and monitoring their oxygen levels and development---his conclusion was to recommend that we stock the HDPE vessel as a great alternative to a barrel for aging these beers. He believes they have some distinct advantages! Let's talk about the value of conditioning beer on wood. Exposing beer to a wood surface will impart many complex flavors to the beer, whether the wood is new or old. New oak produces intense vanilla-like flavors when exposed for two months or longer, and in time will produce cognac intensity with some hints of oxidation. If the wood has been charred, the cognac flavors will become stronger and the char will absorb some chemicals in the beer, like diacetyl, and smooth them out. If the beer has active yeast, in secondary fermentation, the wood will act as a physical anchor for the yeast and you will get more complete fermentation and dryer beer. You can achieve these qualities either in a properly prepared wood barrel, or by putting significant amounts of wood sticks into your secondary fermentor. In the case of lambics and stored sour beers, a wood barrel has been traditionally used because, like wine, it allows very slow oxygenation. For beer, we are taught to believe that oxygen should be kept completely away from our beers. However, very small amounts of oxygen can impart interesting flavors, even in "clean" beers. Regular, tight 60 gallon barrels are excellent for this purpose. Smaller wood barrels have a greater surface to volume ratio, so you need to be careful of too much oxygen exposure. People have found that this oxygenation improves the fermentation of the many organisms responsible for sour beers. With wood barrels, or the wood sticks, you need to pay close attention to making sure that they are sanitized. Wood normally harbors bacteria and wild yeasts that are difficult to completely eliminate. 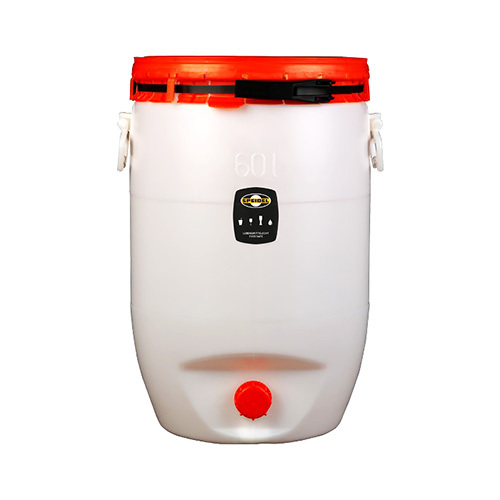 For barrels that have been carefully stored, away from mold and and dreaded fruit flies, there are many proven methods of cleaning. Rinsing them with a liquor of your choice can provide pretty good sanitation and flavoring, prior to filling with beer. Since the idea is to store the beer for long periods of time, there are a few considerations. You should always store the barrel or carboy with an airlock and if you have CO2 equipment you might consider installing a purge port. You should also think through how to empty the container for bottling. When siphoning is not an option, I have found that a slow pump, like a peristaltic pump, fitted with a coarse inlet filter and a fine outlet filter will prevent being clogged by fruit or large sediment. I recently did a side-by-side test of a 15 gallon oak barrel and a 15 gallon plastic carboy made by Speidel. Wood sticks were inserted into the carboy. Over the first two months, tastes associated with oxidation were more pronounced in the wood, probably because the wood was still tightening closed. However, after 6 months, the differences were negligible, and I could not taste any flavors from the plastic.